Part II of the saga of a guy just trying to get some work done around the house. When fall finally arrives after surviving the tortures of 100 degree temperatures, 120 percent humidity, pool trips, barbeques, and general merriment it is time to get your yard ready to survive the coming winter. Over the winter months you will not have to spend much time with the upkeep of your yard and with some good planning you can make your yard grow back thicker and greener once the terrors of spring roll around. Another shot of our yard, just because. Your first step in preparing your yard for the winter is to cut back all your hedges, plants, and other non-grass related growth. The first time I did this I was convinced that I was going to kill every last one of my plants. This wouldn’t have been all bad because it would mean a bit less yard work for me but it would also mean having the yard in the neighborhood that says to everyone, “Oh, so that is where the serial killer lives.” Luckily I am the son of the venerable David Earl Clark, and he convinced me that cutting back the plants is healthy and will make them grow back in the spring more green and lush than the year before. It is important to know which plants to cut back and which plants to trim. I wish I could tell you there is an easy way to know, and maybe there is, but I certainly don’t know the answer. I’m sure my Dad could tell you because he is the one who told me. I just cut back the plants he pointed out to me the first year we lived in this house and then put it on a repeat cycle. Cutting back the hedges can require some specialized tools. I will borrow, again from the honorable David Earl Clark, a device that I don’t know the name of but is essentially a high powered, gas fueled hedge trimmer on the end of a 14 foot pole. This allows me to reach all those hard to reach places on my various trees and to cut through some of the thicker brush. I use this device, as well as my edger (see below) and hedge trimmer (see below) to cut back my plants to what I think is a reasonable length. Here is a before and after of some trimming. After all the hedging you will have inevitably added armloads of small sticks and branches to your yard that was already full of once beautifully colored leaves. Now the leaves have turned into a color similar to the Constitution with essentially the same consistency. (Who doesn’t love the sound of leaves cracking under your shoes?). How do I get rid of all this yard waste? You have a few options here. (1) Get some yard waste bags from your local hardware store. These are usually super-sized brown paper grocery bags. Fill them up and leave them for your trash guy on the day designated for yard waste. This is a perfectly reasonable solution but who likes to rake up all those branches and leaves to put in bags? No one, so then there is a second option. (2) Gather up all your waste and pile it in a corner. All this organic material is biodegradable. How could it not be? Leaves and branches are the very definition of biodegradable. If you pile all your stuff up in a corner of your yard all your “waste” will dissolve down into a nice pile of mulch that will be great for the spring to put on your plants. This is a much better idea than having the trash guy pick it up but it still requires you to do all that hard work picking up the branches and leaves. How can I get similar results without the work? That brings us to my favorite option; (3) mowing for mulching. Do yourself another favor and get yourself a mulching lawn mower. I hate to rake leaves. I know that now that I’m a father I should be raking leaves into a big pile so Cece can run and jump in it, throwing the leaves everywhere and ruining all the time I spent raking in the first place but that just seems unnecessary. With a mulching lawn mower you can simply run over top of all those pesky leaves and the mower will grind them up and spit them out as much needed food for your grass. What is the next step now that your plants are pruned and all your yard waste has been turned into grass food thanks to your trusty mulching mower? Well, as much as this ground up sticks are good for your grass they just aren’t enough. Now it is time to put down some fertilizer to make sure your grass grows thick and lush. Ok, that is a lie. You are getting your yard ready for winter so your grass isn’t going to be growing for several months. Your real goal here is to keep your grass alive and kicking underneath the multiple snow storms, ice storms, rain storms, and general cold nastiness that are coming your way. Think of it as a bear preparing for hibernation. The bear eats the poops out of as much fish it can find to get big and fat (like me) since it will be taking a nice long nap and not eating for a while. The same thing happens for your grass. Get the grass fed so it can be nice and strong when spring finally arrives. When are head out to the local hardware store for your fertilizer, make sure to take a look at the bag for two things. (1) Check on the safety of your fertilizer. Fertilizer is inevitably full of chemicals that are bound to be harmful to humans and pets but some fertilizer is better than others. Make sure to pick up a bag that says it is safe for pets and people so your 17 month old daughter or your 6 year old dog don’t eat it all up and then die. (2) Take a look at the spreading instructions. Most fertilizers will let you know the best way to spread. My Dad and I share a Scotts drop spreader that has a turn dial to indicate the setting depending on what you are spreading. Grass seed will be set at one setting and fertilizer at another. The spreaders are inexpensive and worth the money so you don’t have to spread the stuff by hand. Finally, after you have pruned, mulched, and fertilized there is one more vital step to winterizing your yard that, in fact, has nothing to do with your yard. Before you are done you have to climb up on a ladder and clean all the leaves and other garbage out of your gutters. Yes, the falling changing colors of the foliage are beautiful but it is also a nuisance that tries to flood your house by clogging every gutter and downspout you have. This has nothing to do with your yard but is just a public service announcement. Clean your gutters people! Be on the lookout for part three of this three part series, "Getting the Right Equipment"
P.S. 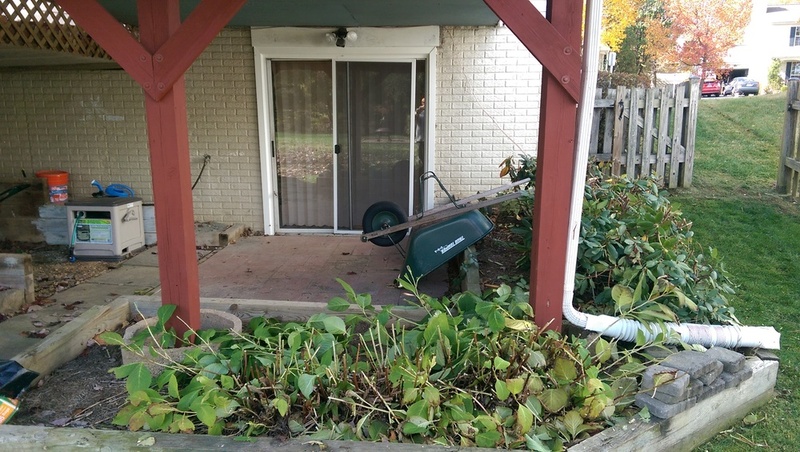 Enlist some help when you are winterizing your yard. I didn't ask my Dad to help but he loves to do yard work so he stayed of his own free will. It still took us about 5 hours to finish up my moderately sized yard. If you take this on yourself it could take several days. Thanks. Dad.